Seawise Giant, later Happy Giant, Jahre Viking, Knock Nevis, Oppama, and finally Mont, was a ULCC supertanker (ultra large crude carrier) that was the longest ship ever built. She possessed the greatest deadweight tonnage ever recorded. Fully loaded, her displacement was 657,019 tonnes (646,642 long tons; 724,239 short tons), the heaviest ship of any kind, and with a laden draft of 24.6 m (81 ft), she was incapable of navigating the English Channel, the Suez Canal or the Panama Canal. 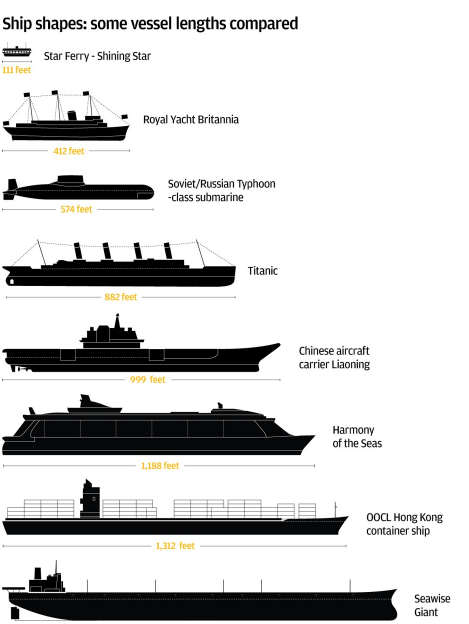 Overall, she is generally considered the largest ship ever built. She was sunk during the Iran–Iraq War, but was later salvaged and restored to service. She was last used as a floating storage and offloading unit (FSO) moored off the coast of Qatar in the Persian Gulf at the Al Shaheen Oil Field. 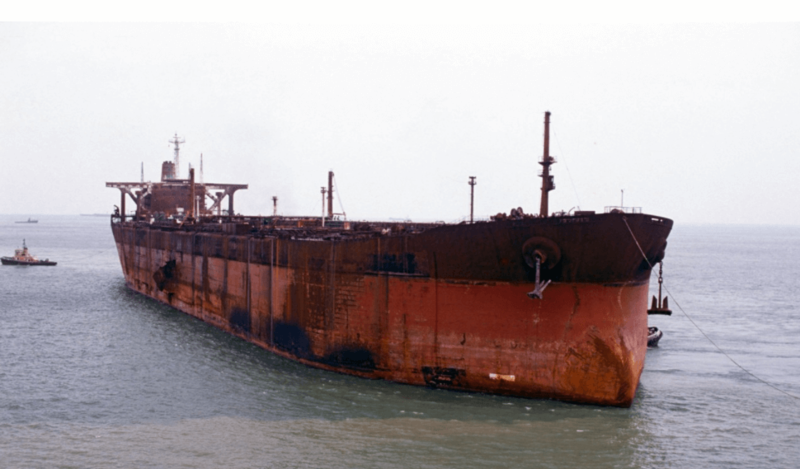 The vessel was sold to Indian ship breakers, and renamed Mont for its final journey in December 2009. After clearing Indian customs she sailed to Alang, Gujarat where she was beached for scrapping. Mont, previously known as Knock Nevis, Jahre Viking, Happy Giant and Seawise Giant, was a ULCC supertanker. Before its decommission it was the longest ship ever built. After its final journey in 2009, it was intentionally beached in India for demolition. “The incredible story of Seawise Giant, which went on to be bombed, sunk and eventually salvaged to enjoy a second life on the ocean waves. Strange then, that so few people know the history – and strong link with Hong Kong – behind this gargantuan sea vessel: all 564,000 tonnes of her, 50 feet longer than New York’s Empire State Building is high, with a hold that could swallow London’s St Paul’s Cathedral four times over. She was the largest self-propelled man-made object on the planet. The ship, which aptly came to be called the Seawise Giant, was an ultra-large supertanker built by Sumitomo Heavy Industries in Japan for a Greek business mogul. By the time she was ready, in 1979, the tycoon had either changed his mind or had gone bankrupt (reports vary) and refused to take delivery. Not content with her already stonking size, Tung senior had the ship’s length extended a few more feet by way of ‘jumboization’ – a technique which involves bolting on another section – increasing the capacity by more than 140,000 tonnes. Seawise Giant was now 1,504 feet in length and 225 feet in beam, record-breakingly large to this day, but not the most nimble of ships. She had a turning circle of about 3km, and it took her 9km to stop from her full speed of 16.5 knots, and that was in good weather. The tanker’s purpose was to transport crude oil between the United States and the Middle East, which she did for seven years before she found herself an unexpected target during the Iraq-Iran war in the 1980s. In May of 1988, while moored off Iran’s Larak Island and loaded with Iranian oil, Seawise Giant was parachute-bombed by Saddam Hussein’s Iraqi forces. 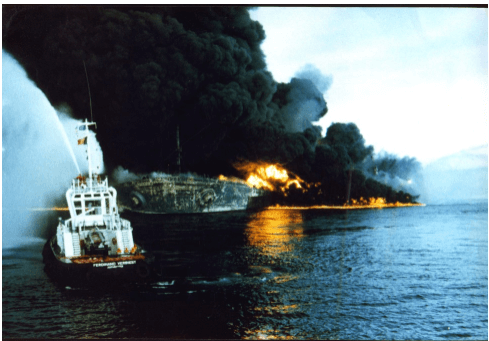 Unsurprisingly given the flammable nature of her cargo, the tanker raged with fire and sank in shallow water. Despite being declared a total write-off, Seawise Giant was rescued by a Norwegian company a year later, at the end of the war. She was refloated and towed to Singapore for major repairs, with 3,700 tonnes of new steel being replaced in the process. This article was first posted on 27th March 2018.